Looking for a new family adventure? 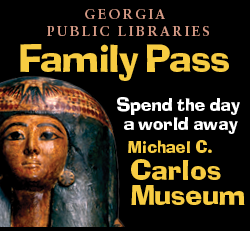 All you need is a library card to check out passes for free or reduced admission to great destinations in Georgia. Visit Zoo Atlanta, the Center for Puppetry Arts or any of Georgia's 63 state parks and historic sites. Start planning today!